An anonymous user from Futaba Toy discussion board has posted the toy images of upcoming Kabaya Transformers Gum figures - Super Ginrai, God Bomber & G1 Starscream. As you know, these figures require you to assemble it, yet they are capable of doing transformation from robot to alternate mode or vice versa. All 3 figures are expected to be released on March 2011 in Japanese retail market. BBTS News: Marvel Legends, One:12 Moon Knight, Shazam, Freddy, Dragon Ball, Batman, Mai Shiranui, Persona & More! I love these little guys. Bring 'em on! Already resigned myself to the fact that I'll wait the 6 months it'll take before one of the specialty stores in my area gets these shipped in and then I'll pay an absolutely insane price for these little buggers but I just HAVE to have them. These are just so cool! Seeker army.. Let's do it. That would be Super Ginrai being sold individually, not God Ginrai. Might have to get a set of the Ginrai stuff. One of my all time favorite Transformers designs. 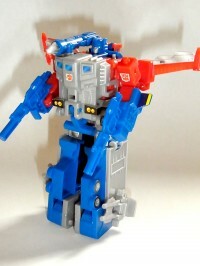 So... given that this Ginrai has elbows, does that make it more articulated than the original? Wow visiting Japan must be like jumping in a time machine and going back to the 80's. Do they even put toys in bubble gum or cereal boxes in the USA anymore ??? Or did the government put a stop to that in the 90's due to stupid safety regulations ??? RogueDeathangel wrote: So... given that this Ginrai has elbows, does that make it more articulated than the original? DUDE, I need God Ginrai. Too bad he can't do normal Ginrai mode, but I suppose the elbows partly make up for that. Starscream looks really good too, but my main purpose for these is WST substitutes, and I already have Starscream. Don't know why, but I gotta have these! I'm pretty sure their a little taller than your average Legends class, from what I remember from TJOmega's review of the second wave. These actually look pretty decent. However by the time they hit US shores, sellers are going to want $20-30 a piece for them and bubblegum toys just aren't worth much more than $10 including shipping. So as I have for all the past series. I will sadly pass on these. These look epic. Mach got me hooked on them after Wave 1 and 2. I can't wait for this set. This would really work in my WSTF collection! G1 Prime (from the first wave) is about 4 inches. 3,762 pages were recently viewed by 511 unique visitors. This page was viewed 1 times on Friday, April 26th 2019 5:22am CDT. © 2019 Seibertron, Inc. DBA Seibertron.com. All Rights Reserved. Established June 2000. Seibertron.com is owned by Ryan Yzquierdo.